The majority of wood chips carriers that occasionally visit the Clyde to discharge cargoes of animal feed are elderly vessels - this one is an exception. 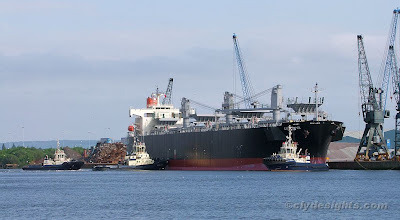 CATTLEYA is a new ship, delivered to in December 2008 to Panamanian owners by the Tsuneishi Shipbuilding Co. She is 199.9 metres in length, and has a deadweight of 49,368 tonnes. CATTLEYA was seen on Sunday as she berthed at Shieldhall with a cargo of feed from South America, part of which had been discharged at Amsterdam prior to her arrival on the Clyde.